Be careful with the transition. 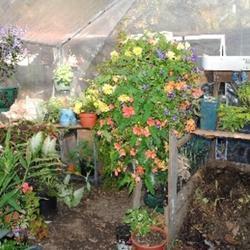 Don't just move them from a warm house into a unheated greenhouse. will do, I'll probably do an abridged version of hardening off and try to move them out the last time on a warmer day. But thanks for the advice! I also will build a small (3' x 3' or so) compost pile in the GH when I start my seeds. The heat of the pile helps to control fluctuating nighttime temps. Can you elaborate more on this. Will Allen ( Growing Power ) uses huge piles for large greenhouse. I'm interested in the smaller scale. I found a photo. This is the GH at the end of the season, not the beginning, but I had no camera during springtime last year so it's all I have. I built a roughly, 3.5' x 3.5' compost bin in the NE corner of my 10' x 12' GH. In approximately 6 weeks I'll start a *hot* compost pile with plenty of nitrogenous material in it to facilitate a quick start. It'll be plenty gassy for about 2 weeks but by the time I'm ready to start seeds it'll be decomposing rapidly, thus producing ambient heat. I'll use a fork to lift it a bit in the evening as I'm closing up the GH for the night. The introduction of fresh air into the pile at that time will help it to cook hotter overnight, thereby adding heat to the GH and saving me some worry about freezing nighttime temps. The most tender seedlings will sit on the planting shelf built over the compost pile; the warmest spot in the house. soil wrote: does anyone out there start there seeds in a greenhouse? we have an unheated greenhouse that still gives us a good jump for starting seeds before we can plant them out. how do you have your systems set up? right now we have wide shelves above the beds(4 high, 18 inches apart) and they are 2 ft wide. there are gaps in each level to allow some light through. we can have a few thousand starts if need be but most of it is dedicated to propagation/overwintering plants. i feel that the plants come out a lot more squat and sturdy compared to indoors even when the temps are warmer inside.
. ++++you can even start them two weeks earlier that you ususlly do if you add 100 gallons of water in 50 gallon black drums and some smaller plastic 20 gallon plastic boxes. I suggest the dark green plastic containers with lids. the water serves two purposes it heats the greenhouse at night and absorbs some of the hot heat during the day!. As long as you have a double glass or plastic this will keep the temperature a few degrees warmer at night. the 20 gallon plastic containers will heat up faster duing the day and give off more heat at night. the 50 gallon drums will gradually heat up and stay about 50 once the real cold nghts are gone! I usually insulate the bottom of the barrels or plastic containers by setting them on top of a foam or insulated base which stops heat from being lost to the floor! Solar is the only way to go! Even a stack of bicks or block set on top of a inslated floor will absorb heat and release it after the sun goes down! I put my cole crops like broccoli on the table top above the water containers so they are cooled some on hot days so they don't get stringy! can anyone give me advice on what to do this year? Normally I start the seeds indoors under a light and then when they get a little too big for the tiny cells I transfer them to larger containers and move them outside to a little greenhouse. (this green house I built is garbage and I want to build a new one) and then I bring them in EVERY NIGHT. and bring them back out every morning. it is super annoying LOL! esp since I"m doing this usually when there is still snow on the ground. SO... I'd like to build a sturdier GH with actual glass. I plan on using the glass from this thing we have outside in the back. it would prob be more like a cold frame type thing (low to the ground like). how can I heat something small like that so that I don't have to bring them in at night? is that even possible? I'd love to just start them inside and then move them outside for good once they're big enough to go into the larger pots. I usually start my seeds March 1st. my plants are usually pretty huge by the time they're in the ground n but our growing season is pretty short so I like them to get a good start. soil wrote: wordwiz, they will work if you plan on putting them out fast. they outgrow the little containers fast. its basically to just make sure things germinate and you get plants out quick. they work good for herb seeds. the reason i use the 72 cell trays more is i can propagate small cuttings in them as well as start seeds. Soil, an update. I sowed 120 super sugar snap peas on Jan. 26. As of this morning about 82 had sprouted, some within three days. There looks to be a few more about ready to break the soil. Some of the early ones are approaching 4" tall, which I presume is large enough to transplant. Last year, I mixed up several 7-gallon pots of dirt, compost, and horse manure. I have a trench in the green house from where I buried hydro buckets and other containers in which I grew tomatoes. I plan on filling it with the stuff in the containers and once it thaws, transplant the peas. Based on the forecast, it may take a week or more which should really test the seedling tray's ability to sustain the peas. I don't have a greenhouse, but if I did, I would still use the trays. To me, part of the point of the trays is to be able to bottom water... pour a little water into the tray and let the soil soak it up as needed. I think it is much more effective than watering from the top and avoids a lot of problems. You can use something like a Sterilite container to hold the water. Last year, I had about 40 trays of plants that I watered once a week. Took maybe 90 minutes. all of our seedlings are open bottom, most of the time i only water once a day, sometimes every other day depending on weather. you can also use those aluminum oven trays...they are pretty cheap. I have a habit of checking the dollar store first for something to serve gardening functions. Today I got 150 popsicle sticks for $1 for marking my seeds. I think one pack will be enough, and you can always come up with a dollar.
. Today I got 150 popsicle sticks for $1 for marking my seeds. I think one pack will be enough, and you can always come up with a dollar. haha i do that too. Today I arranged all my seed packets by when they need to be started in the greenhouse, from Feb. to April. Otherwise, something will get overlooked or get way too leggy by mid-May. Your method looks a lot like mine, using trays to germinate, then transplant. Some I start in the house, some in the greenhouse. I like to grow the seedlings for a while under a grow light at a few inches distance to keep them short. Spindly seedlings do not do well. Right now there are geraniums, petunias, hibiscus, dusty miller, heliopsis, rosemary, german statice, plus lettuce, spinach and radishes up. Tomorrow I'm starting some perennials and herbs. Love this time of year. You guys are all tempting me to do something! Anything! I'm off to a slow start. I REALLY want to get some greenhouse sheeting and cover some of my raised beds with hoops this year for early start.